I know I said I'd post the Christmas book she made last week. And I will when I can find it. The thing with Chloe and her art, is that she is so attached to her work, that she carries it around with her and often loses it in the vast underneath of her bed, or worse, Sophia finds it and destroys it. In the meanwhile, I'll post some of her recent pictures that I have been extremely impressed with. And I definitely need you to Ooh and Aah and tell me what a genius my 5 year old is. Because, frankly, she is. All of the following pictures are drawn in her favorite medium: Ball point pen. I have tried to convince her to go for pencil so she can erase (instead of getting angry and scribbling over the entire picture and then crumpling it up for the garbage), but she is having none of it. Sometimes she leaves it black and white, and sometimes she decides to color things in a bit. Either way, it's all pretty darn good for a Kindergartener. This is a doughnut factory. (You'll also notice that she is getting good at sounding out words to write them for herself.) I'm not sure where she got the idea to do this, but there you go. I love the doughnut machines spitting out the dough onto the conveyor belt. 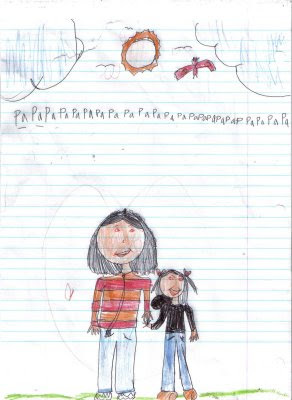 This is Chloe and her Kindergarten teacher. 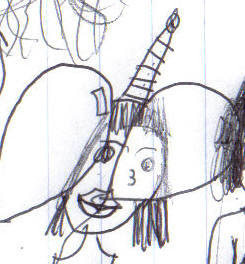 Notice that Chloe's sweater has a hood, which was exactly what she was wearing the day she drew this. Also, her teacher has a zippered sweater/jacket. Don't ask about the papapapa....I'm not really sure what that's about. This is a picture of me and Joel, with Chloe giving Joel a hug. The shelf beside us is a pretty accurate representation of a shelf in our house. Notice that Joel's glasses are round, and mine are square. This is true in real life. Unfortunately, this is one of the masterpieces that little sister got a hold of. You can see how she desecrated it with a red marker. Chloe was beside herself, as usual. But, it wasn't too bad this time. She's got parents who are creative. Gee . . . wonder where she got it from! Awesome pictures. And I love that she's sounding out the words to write them! That's a natural progression for kids and is probably encouraged by her Kindergarten teacher. Chloe definately has a career in the art field! Just keep her stocked in paper and pens! Love them. She did a fabulous job. I too like the machines spitting the donuts onto the conveyor belt. Great illustrations. She is already talented. I'm sure she will continue. Cute, CUTE!! I don't think I ever drew that well. I still don't think I could! Very impressed! Love the party the best too! It could be a story. 6 girls with 6 balloons at a party for a 6 year old....6 party favors, 6 cups....etc. LOL! Oooohh, Ahhhhhh! Those pictures are great! She definitely got the creative gene! Wow, these are truly incredible. At such a young age, she has a real understanding of the structure behind things. 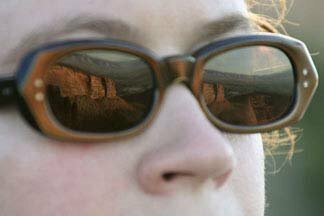 She's really seeing, and understanding what she sees. That's a real gift, and I think she's the genuine article. I'm so glad you're scanning these when you can—keep it up, and keep encouraging her! Wow! Those really are GREAT pictures. She is really talented. adorable! 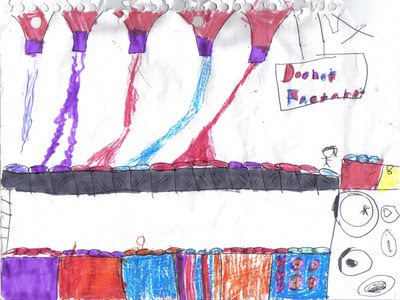 My sister and I used to spend hours drawing Easter Egg Factories that looked strangely like your daughters donut factory. A great walk down memory lane, with excellent artwork to accompany it! Wow! She does have talent! I think the 'papapapapa's are the sound the bird in the picture makes. WOW. I am so impressed that not only does she obviously have a really richly-visual imagination going on, and most probably a photographic memory, and an eye for detail, but she has the ability to portray what is in her mind! SO impressive--beautiful. She is really talented! I love the donut factory. And I love my mom and dad because they are the best in the whole world. You need to frame that one! Awesome pictures! 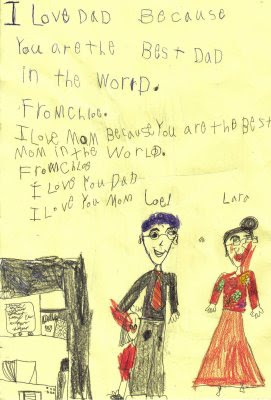 I love it when kids draw the way they see their world and the people they love, it's so honest! Oh, I love them all, especially the donut factory and the pinata picture ! Those are simply amazing! I am 30 years old, and I cannot possibly draw that well, no kidding! 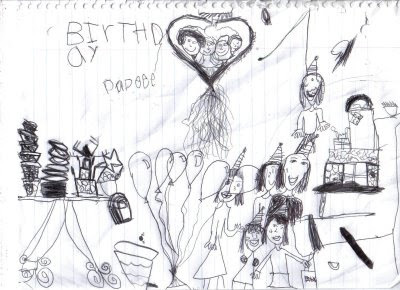 I love the birthday drawing! The detail is amazing for her age. I think you have an artist on your hands! WOW! I am behind checking your posts, and yes, Chloe is a genius! I am not saying that with bias either. It's a fact. You've got quite the artist there. I need to start taking pictures of Lou's art so that I can make her an online portfolio and maybe clean out her art drawer!! Simply Amazing. Her details are just crazy! Wow. It seems everyone's child these days are creating books and drawings...all but mine that is. I was thrilled when Jonah declared he was making a book for his friend yesterday. No words. We'll get there someday perhaps. Chloe is simply amazing! I am SO impressed!